Experience Color Zoom 2014 – explosive color. Take advantage and save during HairCrafters Customer Appreciation Days – Jan. 23rd – Feb. 1. 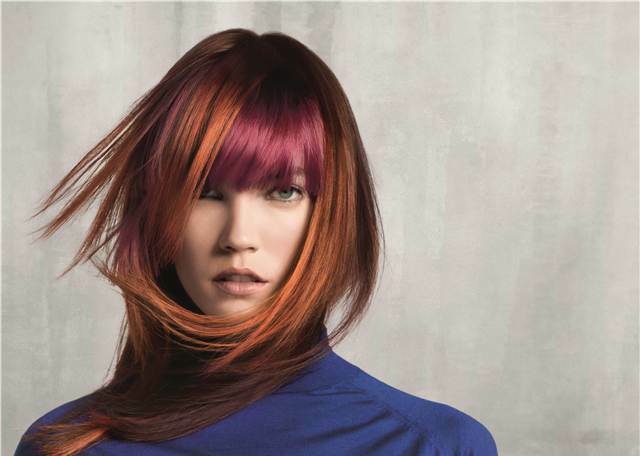 Reallusion—the 2014 Color Zoom Trend from Goldwell®— turns shape and color inside out. Details are hidden and dimension is re-examined. Visual distortion leads to hues that are subtle yet intriguing and to shapes that are bold and inspiring. Color and cutting sectioning are based on prismatic configurations, which allow for delightful surprises within the interior of the head. At first, palettes appear monochromatic—but ultimately, like a kaleidoscop, there are colors, within colors, within colors. Awesome!!! *Buy Now, Redeem until June 30, 2014, Save more than $47.00!!! 2014 will see a new, darker kind of gradient colour. We see crimsons, coppers and violets. These sultry, solid colours will be seen with a clear and purposefully shadowed root area. Unlike ombré, the darker colour is applied on the first inch, only at the roots and looks beautiful on both very straight as well as curly hair. The combination of cool and warm shades will become a key trend in hair colour, as well. Look for interesting, unusual combinations of all shades, creating texture and rich reflections. Chopped locks are now cropping up on the heads of Karlie Kloss, Coco Rocha and Saskia de Brauw.